You are currently browsing the category archive for the ‘AAUP 2015’ category. The following letter was delivered as a keynote speech at the Association of American University Presses annual meeting in Denver, Colorado, June 2015. I am writing in the evening light; the river birds have begun the last of their singing, sweet whistles, and rapid staccatos that are their language. I imagine they are asking one another for the very same things we might ask for, a lasting grace that is more than just their flight. Antonito blooms in the cradle of three rivers, all of which give their names and their water to the Rio Grande west of town. A gorge of andesite rock, scored with petroglyphs, directs the river south through a rift that split the llano in two at the earth’s forming. The petroglyphs mark the passing of ancient civilizations; their crude renderings on the black stone are a lasting proof, a carved longing etched for us to interpret. Thermals rise from the gorge, and the river noise and the raptors make upon them a calligraphy of sound and flight that is like words at their genesis. Further to the west, there is a storm tethered to the San Juans; the bruised sky does not descend east into the canyon cut by the Conejos and lined with cottonwoods. Today, for the first time in weeks, the river has green at her watery edges, the peak of runoff fading. The river is my home; it is what I return to, always my north and brightest star. It is the river that keeps my memories, each bend its own story. For all I know, it is this river of water and stone that is my soul. My friend Cristobal once fished here. This river does not belong to him, he of the fierce face, so angry or so afraid or so brave. This is the river where I saw him last, before the .22 slug to his right temple. The river has made it so that the final memories of many things and many ghosts can be washed clean, wet as water on stone, touched by every current; the river becomes this mirror that is both truth and the shimmer of the half remembered; slow, flat water, which heals and forgives. The river is what I try to save. I believe the river is better than all of us; it knows how we love, and it urges the broken parts of us healed, and that is why I am writing this letter; I believe books, language, and the perfect word hold that same power. Sometimes it is easy to lose sight of what we are meant to do, what we are meant to change in the world. Are we meant to find the good stories, the most perfect word, to find the music of a line or sentence? We are seekers, and that is what we were made to do, to follow the rivers of our youth; linger at the deep pools of joy, pain, and regret; cast our hope to the answers beneath the water’s mirror, that reversal of aspect that allows us to see inside ourselves. We broker in what we see on a daily basis and also that which we imagine. We fuse the two constantly, alchemists that work at new meaning, new vision, new understanding. We must see differently; it is, perhaps, the only requirement of the job. Eliot called it prelogical thinking, and he claimed it was only available to and through poets. Shelley called the poet the hierophant of sacred mysteries, and Stevens, when speaking of the great blue and purple tabulae, said it “spoke the feeling for them, which is what they had lacked.” We must see reflected, there in the word, that which everyone else sees as human and tangible and then imagine it as sacrosanct and beautiful, no matter how ordinary, ugly, or foreign it may seem. Do you believe, as I do, that we are here to save language and therefore the power of the written word? Yehuda Amichai described our modern voice as a “weary language, . . . a language that once described miracles and God.” That is why the books you publish are so important, so necessary—good books, long labors of words and thoughts that seek the sacred peace of a well-written line. It was books that saved me. I come from a place where leaving has always been equated with success. Leaving is difficult at times; the ways out are marked with the glowing road signs of those that tried and failed. The fields at the edge of town are rigged with the land mines of doubt, failure, and fear. Leaving has never been easy. My only stated goal when I was young was to leave Antonito and never return. I would negotiate the land mines, ignore the roadside crosses and the scattered bones of the fallen. I was never a horrible kid in school, though I think there are a few teachers that might disagree with my self-assessment; I do, however, remember being bored, tired of filling in blanks, tired of books that did not reflect me or my place. School was an oppressive force. Were it not for football and friendships I cannot say where my early path would have led. I remember the psychologist the district brought in, her battery of tests on me; the intended goal, I learned later, was to expel me. There were these mentions of reform school or military school. In short, I hated school, and then my freshman English teacher, literally, gave me a key one day. At the back of the room there was a locked cabinet whose contents were off-limits. She would constantly tell me, “Those books are for the seniors.” I am many things, but chief among them, I am persistent, to a fault. Finally, in what seemed like a moment of desperation, she told me, “Go ahead pick a book from back there if you promise to quit disrupting my class.” I was only too happy to oblige; if I never have to conjugate another sentence, I will be a happy man. She handed over the small key, and I walked to the back of the room. I chose Capote’s In Cold Blood, and a new world was opened. Emily Dickinson says that every poem has its trapdoor that the reader must fall through. I fell into that book and knew, at that moment, that I would love books and their saving power for the rest of my life. I cannot remember my first kiss, but I remember Kenyon Clutter and the fact that he ate apples to keep his teeth clean and that he carried a sheep on his fifteen-year-old shoulders through a Kansas blizzard. He was not an important character in the book, but I was in awe of Capote, of those minor details and how much weight they carried. I knew then that books, and the conjuring they possessed, were the first true-feathered bird. Perhaps we are all here to trace and collect words, to sow meaning; we collect that thing which people discard as ordinary and bring it to a page of life where it can flourish and be the map of human struggle and therefore an instruction as to how we can all survive. I worry sometimes that my students are losing their ability to love or appreciate the inexhaustible strength of words and their power. I think they betray that which you and I would never betray, that thing which we give ourselves to like prayer. We call upon language to protect us, give us light, and there is a grace in what we chose to do, the books we give ourselves to, the hard-earned pages that lift us toward being whole. I think that there are others like us, a race of people who still love the eloquent transcendence of the exact word, the beautiful and sensuous hip of a perfectly rendered comma that can send any of us on a river journey toward interminable love. Language is my wife’s love of living and remembered things, language is my mother’s hands or my father’s tired back, language is my daughter’s smile, the medicine of it after I believed that parts of me were broken forever. Language is water that carries me simultaneously forward and into the past. I am writing to you from the banks of the river; the storm never made it off the mountains; the birds are silent and there are so many stars out beyond the dark, swaying bodies of the cottonwoods. I strain for the notes of some sound against canyon walls, but there is only the steady thrum of river. Thank you for the work you do, for your dedication to good and important books, their magic and message, their language of liberation and hope. This letter is in praise of books, their limitless potential and their sacredness. I suppose, by association, this letter is also about friendship and about what is lost or can be lost. I hope to someday show you the Conejos, the river that is my home water. I will show you where I caught my first fish, point out the bend where I last saw my friend Cristobal and his stringer of fish. I will show you my hometown, how much it needs hope, how much it needs books like the ones you publish. We all need to see ourselves in words; each of us needs our history to be told and understood, and for your contribution to this end, I sincerely thank you. I am writing to you from the banks of the Conejos River, and I am wishing you a good night. Perhaps you will dream of words and their origins, and in your dream they will begin to fly and work the dusk light of your memory, collecting in their beaks and in their winged flight the parts of your being that were you long ago, and the words will circle in the alpenglow to form the stories and poems that rise toward the growing night, toward stars, toward the timeless space between their origin and your dreaming them back to the page, forever and forever without cease. Be well, my friend, and keep bringing us toward a place where the music of words is rendered with grace. Aaron A. Abeyta is a Colorado native and professor of English at Adams State University. He is the author of four collections of poetry and one novel. For his book Colcha, Abeyta received the American Book Award and the Colorado Book Award. In addition, his novel Rise, Do Not Be Afraid was a finalist for the 2007 Colorado Book Award and Premio Aztlan. Abeyta also was awarded a Colorado Council on the Arts fellowship for poetry, and he was recently named the Poet Laureate of Colorado’s Western Slope by the Karen Chamberlain Poetry Festival. 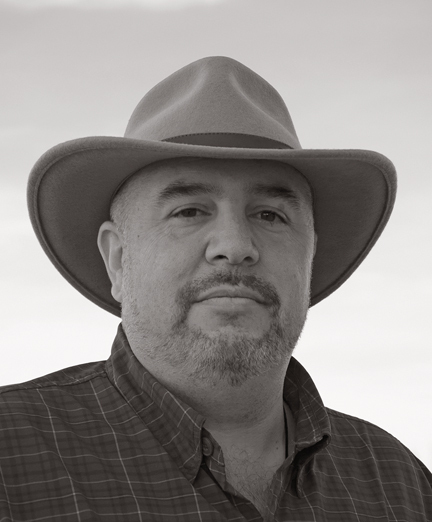 Abeyta’s work has appeared in various publications, including An Introduction to Poetry, 10th edition; Literature: An Introduction to Fiction, Poetry, and Drama, 8th edition; and Conversations in American Literature: Language, Rhetoric, Culture; Colorado Central Magazine; and High Country News. Abeyta received his MFA from Colorado State University. He lives in Antonito, Colorado, where he remains close to his family and culture, both of which greatly influence his work.